Another piece of design that defies its age – the Carlo Mollino Arabesco coffee table. 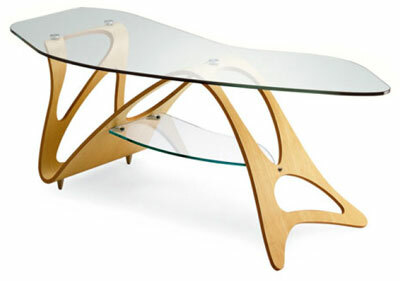 The coffee table was first introduced back in 1949, a typical example of Mollino’s trademark bent ply work, supporting a thick tempered curved glass top with the aid of stainless steel discs. And there’s a lower shelf too, should you need extra storage for your magazines. It;s now been reissued by Zanottoa with a beech or cherry wood veneer, both priced at £1,849.